Update: The video I used is no longer available, but here's another tutorial. These are super cute...my daughters are origami crazy. The eldest has made "sticky-pockets" with post it notes. Fun! Cute project! Thanks for sharing the link to the demo video. I've always wanted to know how to do origami, so these videos are super helpful. these are so cute. great to give as party favors. Oh, so cute! I like your paper, too! A 15 minute tutorial?! Oh dear. Still, sweet things. This is exactly the gift idea I need for a specific friend, thanks! Thank you so much for sharing this, these are great! These are wonderful! They'd make perfect little party favors! do you have a diagram of it? Oooh this made me squee!! Thanks so much for sharing, I've been an origami FIEND since I was a kid but I don't think I've ever seen this before! Wow these are soo cute! What a good idea, very creative! I love love love this boxes. I have made them once before, but now the youtube tutorial doesn't seem to be working. Is there any other tutorial? I would really like to make them again..
Hmm, I don't know. 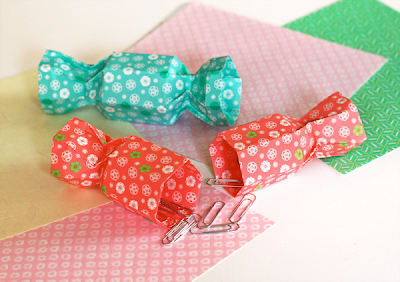 Try a Google or YouTube search for origami candy boxes. Hi! I'm so sorry, but I don't remember the steps to make them. I just followed the video, which sadly is no longer available! Here is a video on how to make this cracker box. Thanks, Alice! We appreciate it!